The singer has had her custom-made clothes and accessories designed by Bob Mackie, 73, for 42 years, but tweeted that he had had to turn down one last tour because of other work commitments. She wrote: "The man who made all my costumes since 1972 decided he couldn't do my last tour. "No matter how disappointed any of u are, you don't know my grief ... Felt I had to tell you. I'm crying." Bob had created costumes including Cher's 1986 Oscars black feathered headpiece, and has previously worked with Bette Midler, Judy Garland, Diana Ross, Liza Minnelli, Tina Turner and Joan Rivers. Bob also tweeted: "Nobody wanted to design this last tour more than I did! I am sick about it. My professional and business commitments were just too great. There simply was not enough time to give this wonderful project the proper amount of care and attention it deserves. "After all these years of collaborating, it is like turning down your own little sister, and how many guys have a little sister like Cher?" 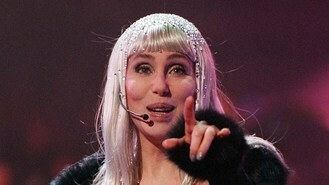 Cher continued: "I tried to convince him to end with me, but he had many reasons a s 2 why he couldn't do it. 2 many obligations n ot enough time even 2 do 1. "Thank God I have a lovely man & wonderful designer!! Hugh Durant. He is talented & brave. We will persevere." Hugh worked with Bob and designed the dancers' costumes for Cher's previous farewell tour in 2002.